Access and manage remote USB and Serial port devices from anywhere! 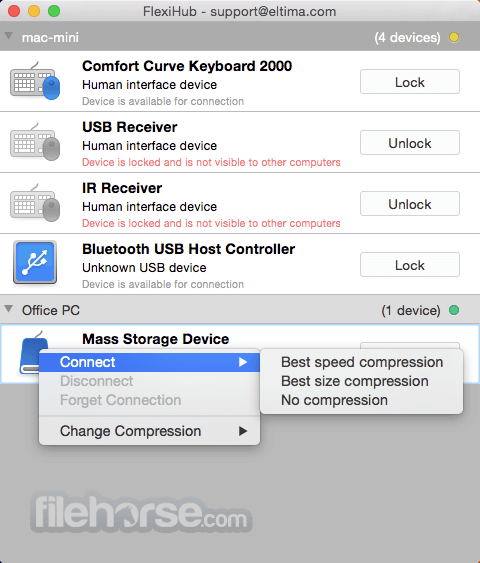 FlexiHub for Mac is a versatile software tool to access the contents and functionality of remote USB devices over network. With FlexiHub you can access and manage remote devices as if they were connected directly to your machine no matter where they are actually physically located - next door or across the globe. The app forms a hardware cloud that has all devices connected to network computers via USB ports. The devices are listed along with their types so you can easily figure out what device you need to connect to - a scanner, a printer, a USB dongle, a camera, etc. FlexiHub users can also invite others to access and work with their shared devices. You can access a device share on a Mac from Windows machine and the other way round. The app is especially helpful in corporate environment where it is often required to share data - in a fast, efficient and secure way. The safety of your data is guaranteed by secure 256-bit SSL encryption, you do not need to worry about your sensitive data being accessed by an unauthorized party. By compressing data, FlexiHub in effect reduces data traffic. This powerful application is also very easy-to-use, all you have to do is to download and install FlexiHub: a server part on a computer whose USB ports are to be shared, and a client part on computers that need access to the shared ports. Once you share a USB device, it becomes accessible to all authorized users in the network. FlexiHub for Mac can be integrated into other software solutions, please try our API evaluation program and test FlexiHub integration. 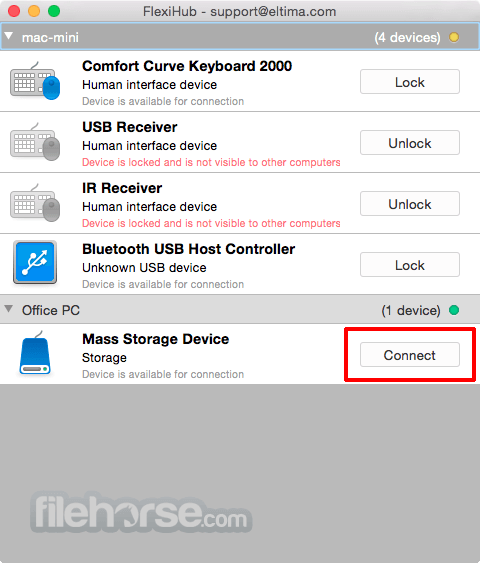 FlexiHub’s unique software allows sharing USB and COM port devices over Internet or LAN. Thus they become available for usage on remote machines. Now you can freely access a USB dongle plugged into your home PC while at office, or connect to any device which has been shared with you for remote debugging. 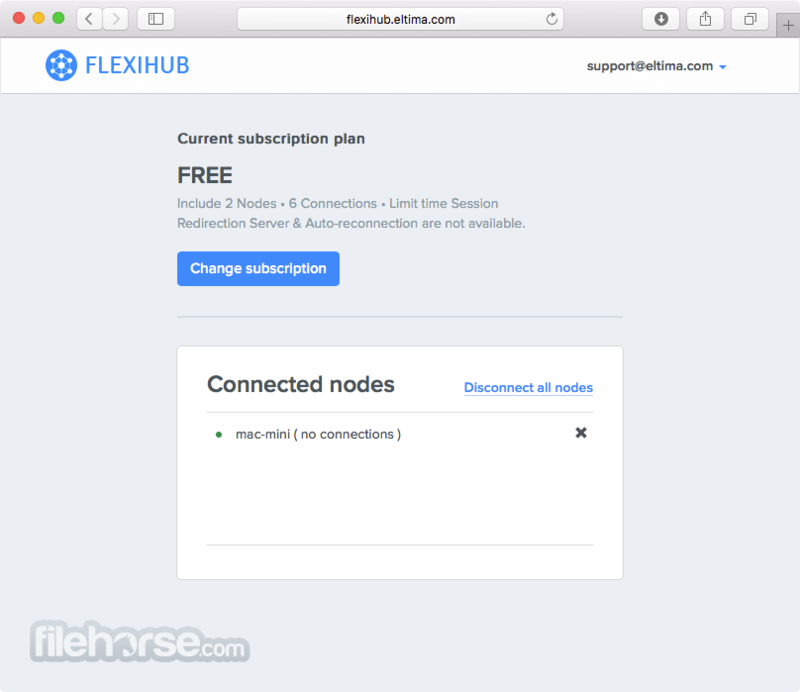 FlexiHub for Mac deploys advanced security for communications — 256-bit SSL encryption. It enables an extra layer of protection for data transfer, as well. Due to this maximum encryption security, you do not need to worry about your sensitive data when using USB and serial port devices remotely. Since FlexiHub can send traffic through its own Redirection Server, your computers do not necessarily need a real IP address. 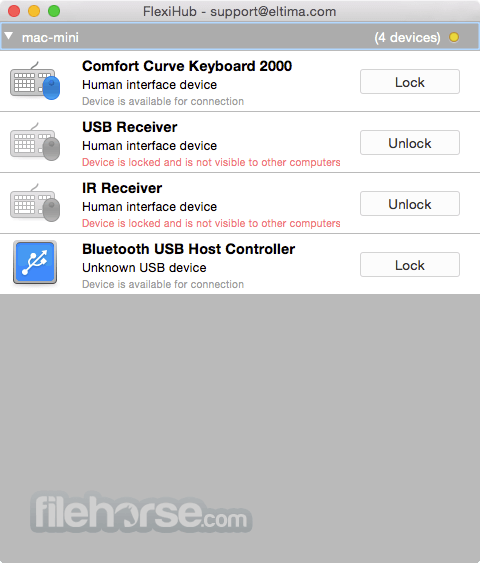 Though your local computer will not directly "see" the other computer with the USB or serial port device plugged into it, thanks to FlexiHub, you can still connect to this device remotely. Traffic compression during data transfer helps speed up interaction with certain types of devices and reduces Internet traffic. This may be useful for those USB or serial port devices which transfer data in an uncompressed format, like scanners. You can choose between best speed and best size traffic compression, depending on your needs. 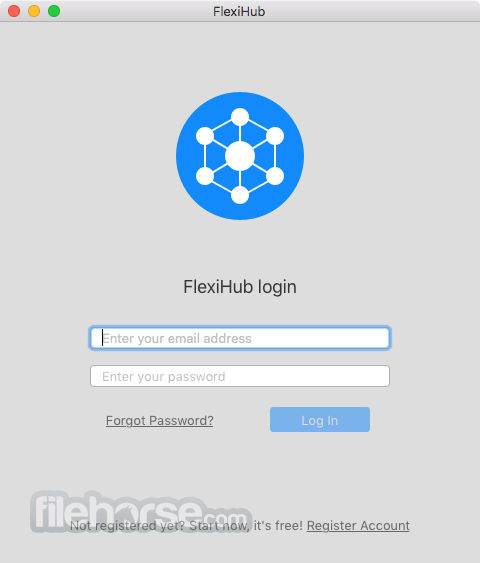 Not only is FlexiHub a global solution, it also lets you share and access remote devices throughout Windows, Mac, Linux and Android platforms. A revolutionary service for connecting to remote USB and COM port devices via Internet or LAN. Get a single point of control for all USB and COM ports connected to your remote computers. With FlexiHub you can use any device in real time -- no matter if it is located in the next room, at home while you are at the office, or even overseas. Different computers with your USB and serial port devices attached appear as nodes which can be accessed remotely right away. FlexiHub lets you manage devices remotely -- connect to them and then disconnect without your physical presence at the remote site. Any remote nodes can be accessed from your current location totally securely thanks to encrypted communication. For your convenience, the USB device type is detected and displayed automatically (printer, phone, keyboard, hard drive, flash drive, camera, etc.). So you always know for sure which device to connect to, or on the contrary, which USB device should be secured from remote access, if needed. Serial port devices have a special indicator. You can block any USB or serial port device connected to your computer so that it cannot be used remotely with the help of FlexiHub. Locked devices will not be displayed on the remote node, so no one will be able to connect to it without your permission. Note: Can connect only two nodes and one device. Devices are disconnected after 20 minutes. Requires FlexiHub account.